Reavis Z. Wortham won the 2019 Spur Award for Hawke’s War in the Best Mass Market Paperback Novel category. The Spur Awards are presented annually by the Western Writers of America, WWA. The award is given “for works whose inspiration, image, and literary excellence best represent the reality and spirit of the American West.” Hawke’s War is the second book in the Sonny Hawke contemporary western series distributed by Kensington Publishing. 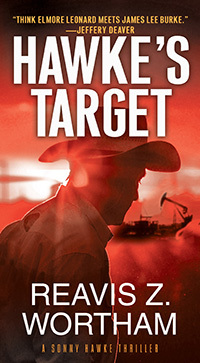 His newest novel in this series, Hawke’s Target, releases June 25. Pre-order Hawke’s War at Amazon, Barnes & Noble, BookPeople, Books-A-Million, IndieBound, iTunes, Kensington Books, Kobo or The Poisoned Pen, and add it to your Goodreads “Want to Read” list! As the 1960s draw to a close, the rural northeast Texas community of Center Springs is visited by two nondescript government men in dark suits and shades. They say their assignment is to test weather currents and patterns, but that’s a lie. 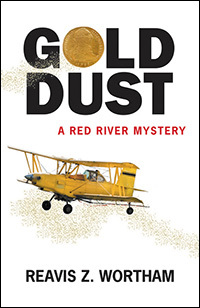 Their delivery of a mysterious microscopic payload called Gold Dust from a hired crop duster coincides with 14-year-old Pepper Parker’s discovery of an ancient gold coin in her dad’s possession. Her adolescent trick played on a greedy adult results in the only gold rush in north Texas history. Add in modern-day cattle rustlers and murderers, and Center Springs is once again the bull’s-eye in a deadly target. The biological agent deemed benign by the CIA has unexpected repercussions, putting Pepper’s near twin cousin, Top, at death’s door. The boy’s crisis sends their grandfather, Constable Ned Parker, to Washington D.C. to exact personal justice in our nation’s capital, joined by a man Ned left behind in Mexico and had presumed dead. The CIA agents who operate on the dark side of the U.S. government find they’re no match for men who know they’re right and won’t stop. Especially two old country boys raised on shotguns. But there’s more. Lots more. Top Parker thought only he had what had become known as a Poisoned Gift, but Ned suffers his own form of a family curse he must deploy. Plus there are many trails to follow as the lawmen desperately work to put an end to murder and government experimentation that extends from their tiny Texas town to Austin and, ultimately, to Washington, D.C. Traitors, cattle rustlers, murderers, rural crime families, grave robbers, CIA turncoats, and gold-hungry prospectors pursue agendas that all, in a sense, revolve around the center of this little vortex called Center Springs.